The day after SIHH, I found myself walking around the cobbled streets of Geneva’s old town. It’s a very different Geneva to the vast, softly furnished halls of the Palexpo, or even the squat monoliths of the famed manufactures, with their clean rooms and airlocks. No, this street was winding, cobbled and, even though the day was sunny, cold. 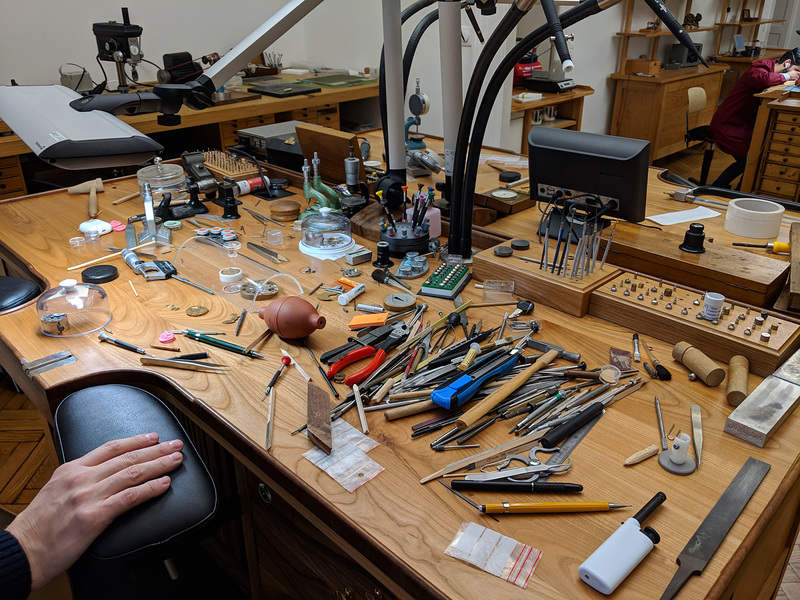 It was a street filled with art galleries and antique stores and, as I was to discover, one of the most exciting watchmakers in the business right now. In many ways, watchmaking is all about light. It’s something that’s incredibly important both in design and construction, and it’s apparent at Akrivia. For one, the facade of Akrivia is dominated by large, wide windows allowing natural light (and more than one curious onlooker) unfettered access to the open workshop, where red-coated watchmakers quietly and intensely work. Before the workshop though, there’s a reception area, and it’s here where I sat down with the prodigy and passionate founder of the brand, Rexhep Rexhepi (Su Jia Xian from WatchesbySJX was also there, but that’s just a coincidence). Initially our conversation was focused on the watches on the trays. The quality of all the pieces is truly exceptional, and the style of the Akrivia-labelled watches, such as the first generation Tourbillon Régulateur or the second gen AK-06, was modern in design and faultlessly traditional in execution. 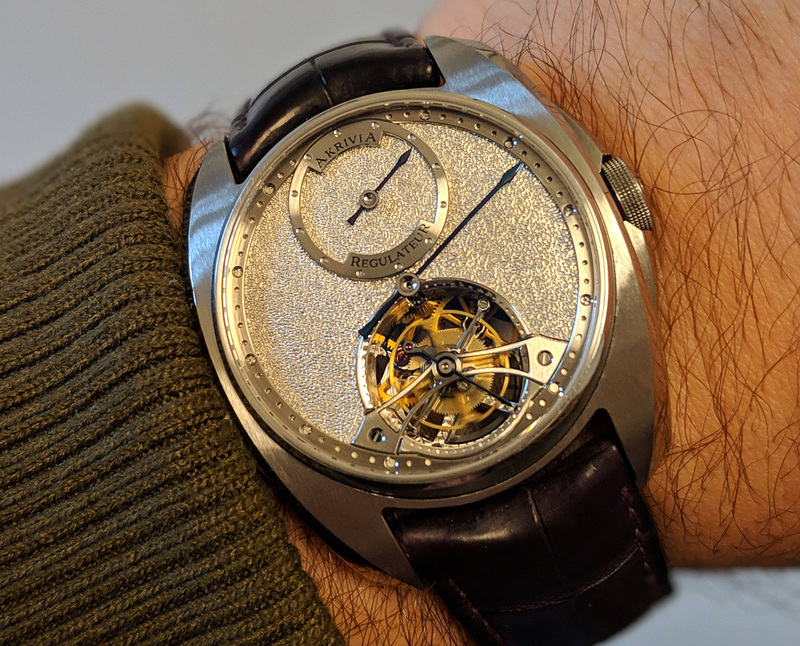 However, I found my eyes drawn to two Chronomètre Contemporain models, which recently took home the best watch prize at the 2018 GPHG. I’ve had the pleasure of holding some phenomenal watches in my career – watches from Daniels, Dufour and Smith, and Akrivia’s watches seemed to me to have something of that same legendary quality. A quick aside for those who aren’t sure just who Rexhep and Akrivia are and why they’re blowing up. 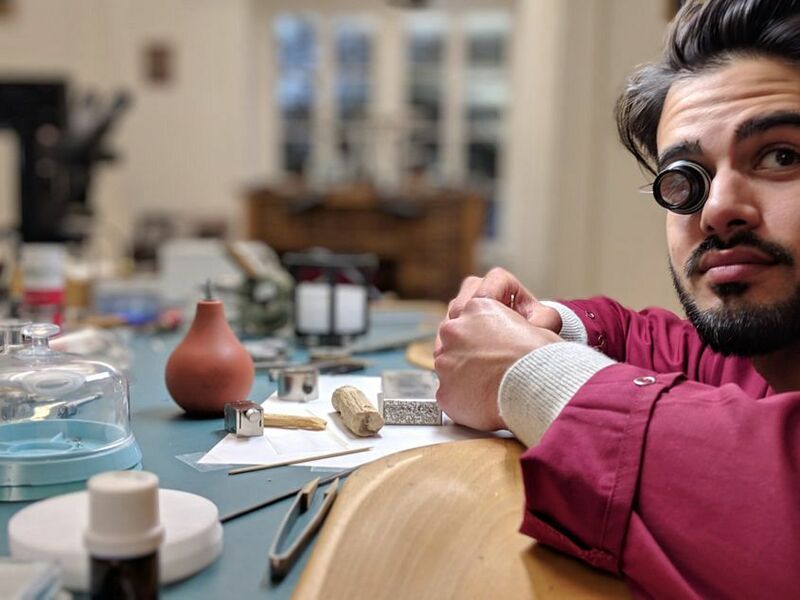 Even before the GPHG win made Rexhep something of a celebrity among the horological cognoscenti, he had been making waves. In fact, he was making waves even before the founding of Akrivia only a few years ago in 2012. When Rexhep Rexhepi made his way from his homeland of Kosovo to Geneva in the late ’90s he already had an interest in watchmaking. Not messing around, he applied to Patek Philippe at the age of 14, and was accepted as a trainee at 15. He trained at Patek for three years, and worked there a further two. A stint at BNB Concept — a high-end, conceptual lab — followed, a lab that was later acquired by Hublot. Rexhep then made a move back to more classical watchmaking at F.P. Journe, where he quickly graduated to working on his complex Resonance pieces. But then, at the age of 25, he decided that working for other people was not for him, and he decided to found Akrivia. When I said prodigy in the previous paragraph, I wasn’t messing around. And even though Akrivia and 31-year-old Rexhep are the talk of the town, now is not the time for laurel resting. Because, shortly after the oh-so-Swiss pleasantries, my conversation with Rexhep quickly moved to the risks of rapid fame, not least of which is getting sick after spending long hours on a plane, for his recent surprise dinner in Sydney hosted by The Hour Glass. No, these are the risks of scaling too fast and too far. 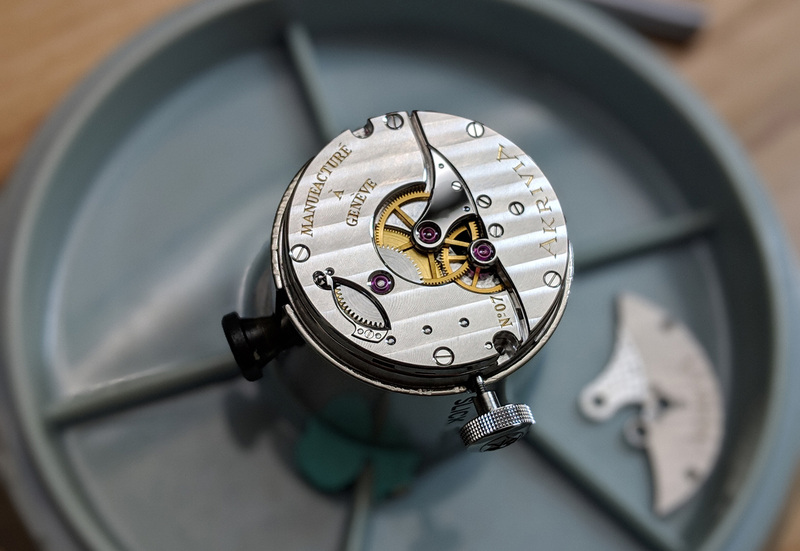 The recent history of watchmaking is full of incredibly talented watchmakers who turned out to be quite terrible businessmen, and who are now remembered only in auction catalogues. 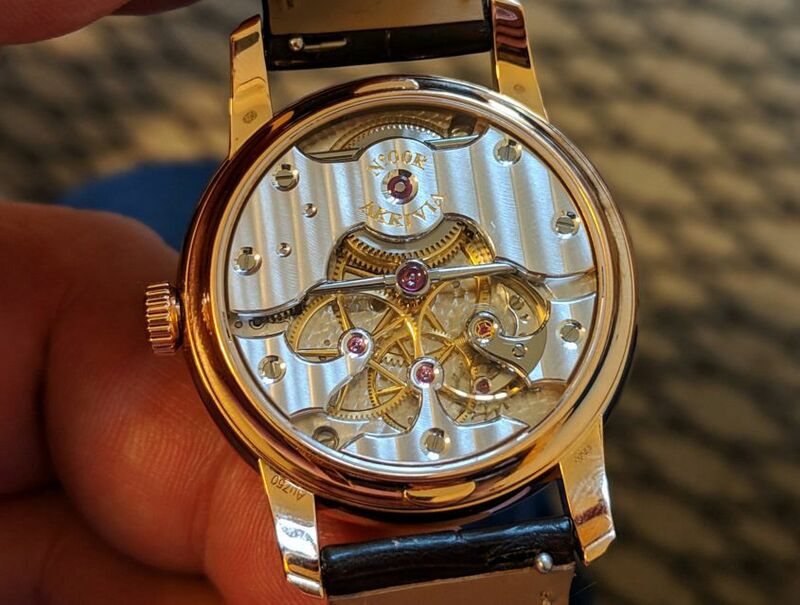 But here, too, Rexhep displays the sort of calm and patience it must take to put together tourbillons of such incredible beauty. Even though the temptation to grow both in production capacity and distribution reach must be there, Rexhep is holding back. We spoke at length about the important, symbiotic relationship between brand and retailer, and what came through is his overwhelming drive to work with retailers who understand what Akrivia is about and what drives him — he’s building something, and isn’t interested in the cash grab. He also spoke fondly of his retail partners, and of his long professional relationship with The Hour Glass’ Mike Tay, and his ongoing advocacy for fine, independent watchmaking. Often the relationship between brand and retailer is described as fraught and oppositional, so it’s refreshing to hear Rexhep’s perspective. 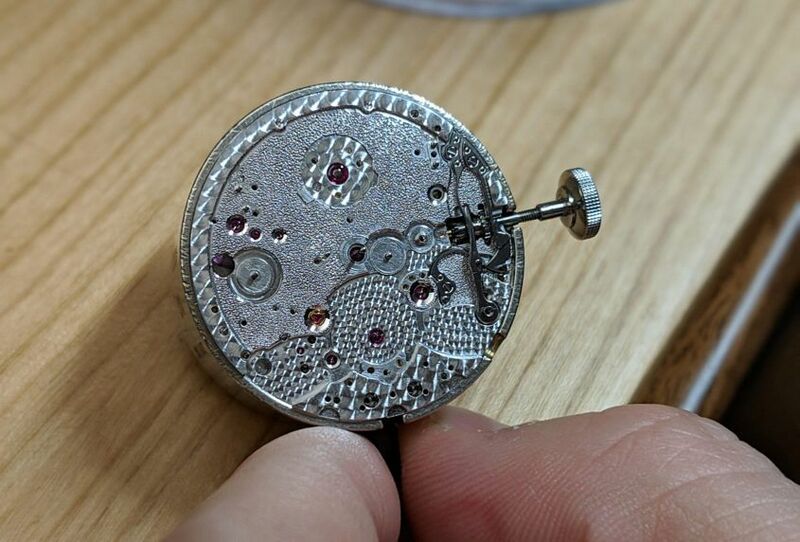 One of Akrivia’s watchmakers, interrupted mid-polish. After this, we continued the conversation in his workshop, where I understandably got a little distracted and started segueing off onto questions about finishing techniques. Akrivia currently has seven watchmakers, all on the younger end of the spectrum, and the energy in the workshop (even to a non-French speaker) is obviously intense, but positive. 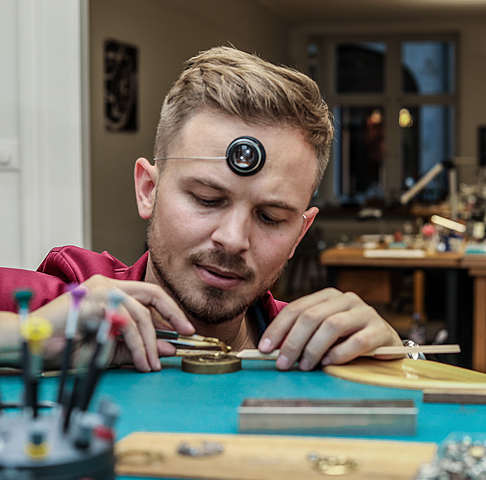 Rexhep explained that each watchmaker worked on a single watch from beginning to end — something that only heightens the sense of the essence of the watchmaker being in the watch. But it’s a workflow that’s not without its issues. Things take longer, as you’re not repeating the same task over and over, and the frustration when something goes wrong with a part that you may have been working on for days is very real. But to me this is part and parcel of fine watchmaking, as are the very idiosyncratic benches. 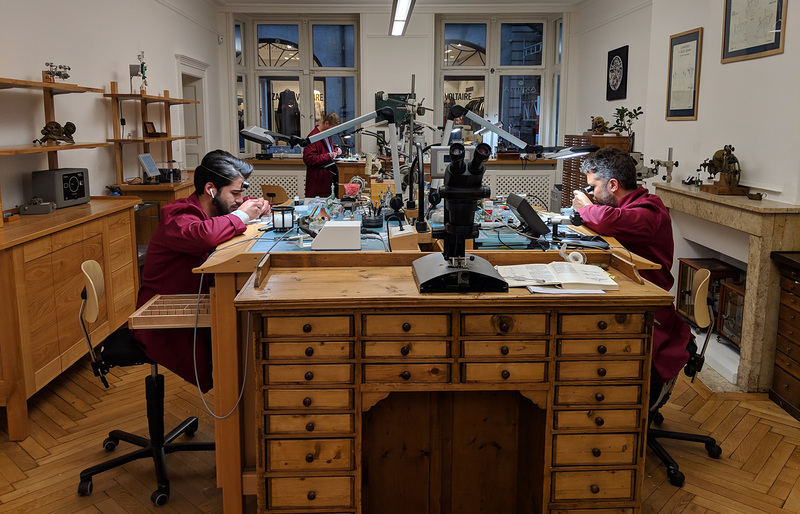 It’s a very personal approach to watchmaking, and one that is a very far cry from the white walls and sterility of the industrial operations. The watchmaking of Akrivia and Rexhep Rexhepi isn’t for everyone — price and production alone preclude that. But it’s incredibly important. 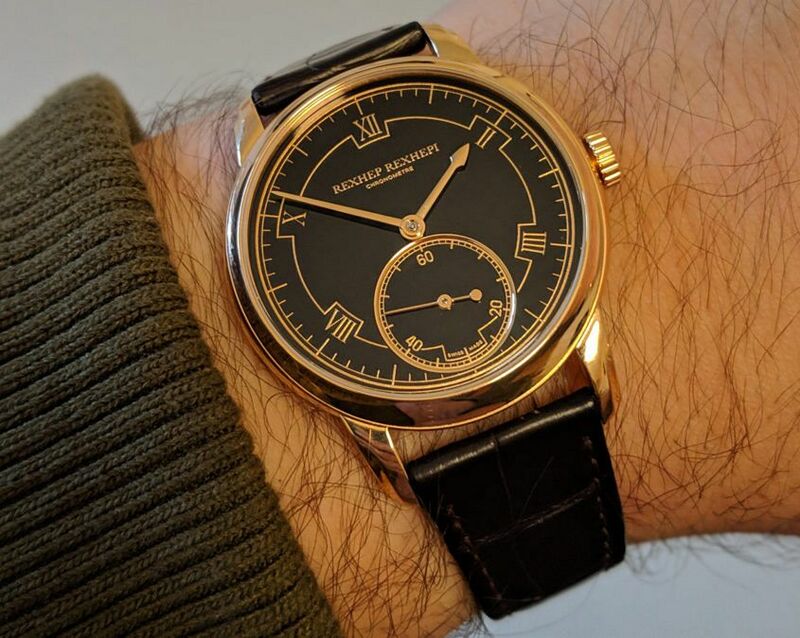 There are people out there far more qualified to judge the merits of his watches (they did, and he won), but I can tell that the combination of raw talent, personality, ego, passion and — more importantly — maturity and restraint means that Rexhep Rexhepi is a once-in-a-generation talent, someone who looks set to be a figurehead for the finest traditions of high horology for decades to come. Rexhep Rexhepi at the bench. Image: Supplied.